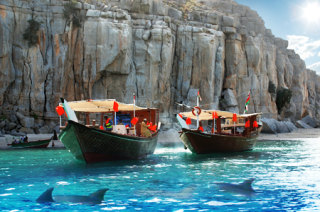 Oman Dhow Cruise is one of the famous kind of tours that Oman is popular with Dhow Cruise In azure waters through a magnificent 16 km fjord (Khor) "avery recommended tour among Khasab tours and travels", surrounded by Fabulous mountains and white sand beaches. You can enjoy watch swimming dolphin at the entrance. Chances for swimming and snorkeling will be available as The Dhow will anchor at various places during the cruise, in pristine where waters crowded with colorful friendly fish. Soft drinks, fruit will be offered during the day. All snorkeling equipment is included.